The Type-R Owners website is the place to be if you are an owner or enthusiast of Honda's Type-R range. Whether you prefer Civic, Integra or Accord then we have something here for you. That isn't to say that Honda NSX and S2000 owners should feel left out as these are also covered! 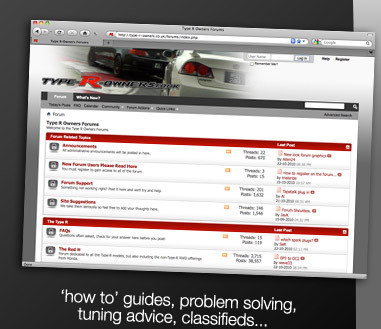 The website has been created as a resource for Honda Type-R owners, enthusiasts and potential owners. Meet like-minded individuals and share your views, thoughts and opinions with them by joining the Type-R Owners website forum. The forum contains a wealth of Type-R related information. I hope you enjoy browsing the Type-R Owners website and find it useful and informative. If you have any questions or would like to know more then please join the forum where we will be more than happy to welcome you to TRO! Famous for making many adaptations of best-selling Honda models, tuning house Mugen has taken the new Civic Type R (recently launched for sale in Japan) and added even more aggressive body styling to the package. The concept adds a revised front bumper with contrasting black parts around the lip and wheel arches. The black theme is continued through the rest of the car, with side and rear skirts giving an aggressive on road stance. The standard rear spoiler is replaced by a lighter, race car inspired design, again finished in black.